Seven Hawaii restaurants are featured on the coveted Annual Restaurant Awards list in this month's issue of Wine Enthusiast Magazine. 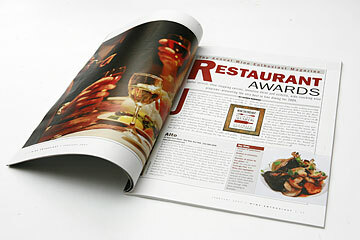 The publication examined service, cuisine, decor and wine in 2006. "An exemplary wine program is about depth, breadth and quality, but also about soul," the magazine says. "It's about offering the top tier of wines from the greatest wine regions of the world, making accessible the most prized vintages, and pairing dishes creatively with wines of all price points." Four of the local restaurants are from chef DK Kodama's restaurant chain, with master sommelier Chuck Furuya consulting on the wine lists -- d.k. Steak House in Waikiki, Hiroshi Eurasian Tapas and Vino in Restaurant Row, and Vino Italian Tapas & Wine Bar on Maui. Also on the list: Gerard's, Longhi's Wailea and Ruth's Chris Steak House, all on Maui. Two restaurants -- Hiroshi and Longhi's -- earned two (out of three) wine bottles, symbolizing a wine list of "unique distinction." Several restaurants in Hawaii chef Roy Yamaguchi's chain, located in other states, also made the list.